We all know that McD's is usually a very busy place, especially during peak hours. However, today was busier than usual. Why? How about free stuff? It appears more and more that restaurants, particularly fast food joints, have been handing out free stuff for promotional purposes. So how better to introduce the new Buttermilk Biscuit Sandwich than to give it away with no strings attached? For me, I guess the Asian in me took over and I *had* to get my free sandwich this morning. After all, my mom has a huge collection of McD's straws at home already... Why stop at hording free straws? So there I was lining up for my fr ee sandwich. To me, this was not exactly my first time trying the sandwich. You see, it has been available in the States for some time. It's only "new" to us in Canada. For those who missed it, it's still free during breakfast on February 10th as well. 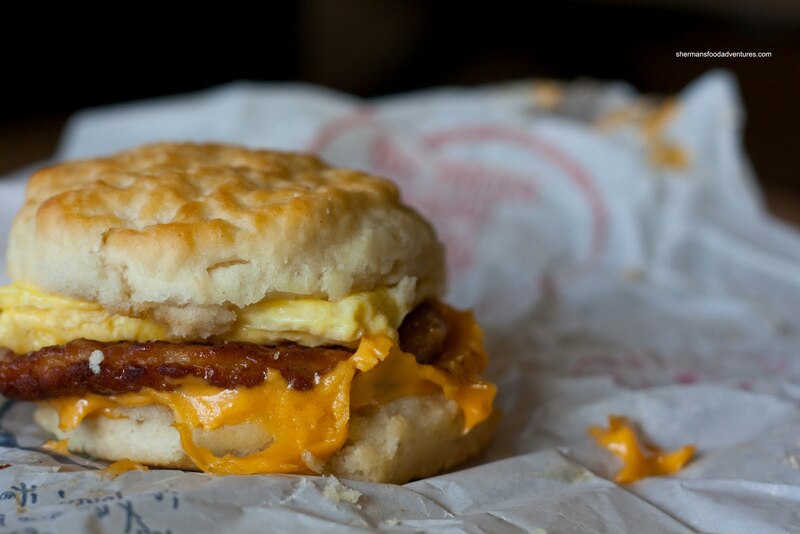 Essentially the same ingredients as a McGriddle, the new sandwich merely replaces the pancake bun with a buttermilk biscuit. There are 2 options for meat - sausage or bacon. Ma had the Sausage Buttermilk Biscuit Sandwich. If I had to make a comparison, the biscuit is more dry and crumbly than the one at Tim Horton's. I wouldn't say one biscuit is better than the other since it comes down to personal taste. One thing is for sure, the sandwich at McD's is noticeably bigger. As for the individual components, the egg is somewhat more natural looking than the one at Tim's. 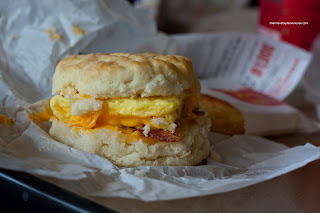 For myself, I went for the Bacon Buttermilk Biscuit Sandwich. Unlike the sausage, the bacon is less substantial and adds a layer of crispiness. I like the sausage biscuit better. In terms of the overall product, I still like it; but it might benefit from more moisture such as *gasp* - more butter! Yah, I have to agree that the biscuit itself was kinda dry. Strange, I didn't remember the one in the States to be as dry. Still think more butter will help the cause. 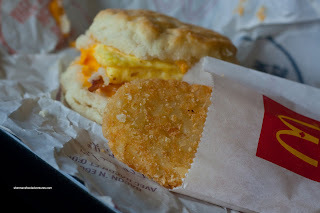 Yesterday after I had a free biscuit sandwich I vowed that I will not get it today. But I woke up this morning and found myself in the drive-thru again. I guess the Asian in me also took over. What, free biscuit? How come I never heard about it? Instead, I went and paid for it last week. I found the sausage quite salty and the biscuit was ok. I still prefer the muffin, since the blandness offsets the saltiness. I tried one of each on both of the freebie days and I found both of my biscuits were buttery heaven with nice crispy edges. I didn't dislike the biscuit actually. Just a bit dry.